Project SERPO’ story gets more credible? 02.27.2006 - New information has been presented that gives people interested in the story of “Project SERPO” more to consider and evaluate. In recent days, people involved in the Web site serpo.org have posted previously undisclosed alleged accounts from former military and other officials who were reportedly directly involved in some capacity with Project SERPO-related activities. Project SERPO is the alleged exchange program between astronaut-trained American military personnel and friendly visitors from a planet in the Zeta Reticuli star system in the 1960s and 70s. 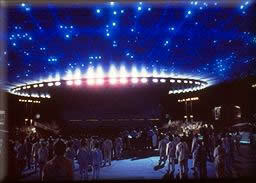 The beginnings of the program reportedly originated after the crash of extraterrestrial crafts in New Mexico in 1947. The follow-up efforts are alleged to have continued into the 1950s and led to a joint-service team of 12 specially-trained U.S. military personnel going with the visitors, aboard one of their advanced spacecraft, to their home planet for a 10-year stay, and returning to Earth in the late 1970s. Natural questions have been raised about the authenticity of these reports. Is it a hoax and fiction? Is it a disinformation psychological operation (PSYOP) of some kind? Is it part of an acclimation program to further educate and prepare Americans and the international population for the reality of extraterrestrial visitation and activities on Earth? Or, is it something else or some combination of things? If accurate or partially accurate, it is certainly interesting that this information has now become public and part of open source intelligence (OSINT). Rumors and accounts of this kind of operation have apparently been floating around military circles for many years. Recently though, allegedly, an unidentified person claiming to be a spokesman for six former and current officials of the Defense Intelligence Agency (DIA) has released new details about the alleged Project SERPO. The new information that this anonymous person apparently has released is claimed to be, “some brief, but powerful testimonials from various USM people involved with ‘Project SERPO,’" according to “Anonymous.” These are alleged to be accounts from military personnel, people involved in the U.S. space program and similar kinds of individuals. Though some of the information discussed in the new accounts has been posted on serpo.org over the last few months, the new data provides more to analyze and assess for truthfulness, understanding and clarification. Anonymous seems to indicate that each following nine sections is from separate individuals. This text has been taken directly from the serpo.org Web site. The nine accounts below are only part of the newly-posted information. The structure of the 12-person U.S. team, their roles and three-digit identifiers (used for operational security reasons) have been previously discussed on the serpo.org site. The team roles and numbers are listed below, as allegedly reported by one of Anonymous’ associates in the newly-posted information. Other new alleged accounts follow. "Project CRYSTAL KNIGHT" was started in the early 1960s. This was part of the original U.S. Space Program, where U.S. military pilots were selected for astronauts. But the military program was classified "Top Secret" because their program involved an exchange of Extraterrestrial Biological Entities (EBEs). The EBEs came from another planet. They called themselves "Ebens" and came from the planet SERPO in the Zeta Reticular Star System, 42 light years away. The Ebens first came to Earth about 2,000 years ago and were involved in the genetic examination of Earth humans. The Ebens then left and returned in the early '40s, setting up a base in northern New Mexico. In 1947, two of their spacecrafts crashed in southern New Mexico. We discovered them and began a relationship with the Ebens. "Project CRYSTAL KNIGHT" was a program that exchanged 12 American astronauts with three Ebens. Our astronauts left on an Eben spacecraft and traveled to the planet SERPO for 12 years, returning in 1978. We are reading about this program in these releases. I was involved in the later program which came after 1978. We had an additional exchange program set up, under "Project BISHOP," but President Reagan cancelled the project in 1985. I was involved in "Project CRYSTAL KNIGHT" from about 1960 until 1965. I was assigned as a civilian to this project. I was a CIA employee, with a specialty of survival in a foreign environment. I was a training instructor at the CIA training camp in Virginia. I trained the 12 men -- NO women -- who went on this mission. They spent about eight months at our training facility. Few knew their exact mission, which was classified "Top Secret/Codeword." I had no other involvement with this mission after 1965. I was very surprised to hear this story come to light now after all these years. I was involved with this program years ago. I was an Air Force Captain assigned to a training element at Tyndall Air Base Florida. We trained these 12 in astronaut procedures. We didn't really know their final mission, but we did know they were going into space. I didn't realize their fate until they returned. I read the classified report and first thought it was a work of fiction. But as I read the report, I realized these 12 men went to another planet, lived among aliens and returned. Four died and eight returned. The "Project SERPO" information that I just read is NOT totally correct. There were two women in the original 16 selected for training. I helped train the team, including the two women. But after the final selection process -- which did not involve any combat training like what was mentioned on the Web site, www.serpo.org -- the two women were dropped from the list. During the training, the Team Members didn't know their actual assignment. When the final cut was made, the 12 selected were sent to a military prison and then told of the assignment. The 12 were isolated from that point on. The 12 were removed from the payroll of the government and placed in a special file within the Defense Intelligence Agency. The DIA was the controlling agency in "Project CRYSTAL KNIGHT" which was the name of the operation. To comprehend the matter involving "Project SERPO," one must understand the complexity of the United States Government. "Project CRYSTALKNIGHT" pertained to the training and relocation of 12 brave United States Military Men to a foreign alien planet, 42 light years from Earth. I was one person in charge of a final phase of training. I was one person who knew the operation. I was one person who knew the names of those involved. However, I never knew the names of the 12 men sent on that special long distance mission. The names were classified. The 12 had numbers, three-digit numbers. But all of the training instructors, mission directors and project managers used their real names. I would believe that most of the older personnel involved in this project are dead. But some of us are still alive. I was shocked and outraged when I first heard about the release. This must be a Defense Intelligence Agency programmed release. I cannot believe that the DIA would allow someone to release this sensitive, highly classified operation without the proper approval. This must be a segmented release project fully controlled by the DIA. Why? I wouldn't even wish to begin to guess the reason. I am awaiting further release of the photographs, which I know exists because I saw them. There are sixteen books of photographs retrieved from the Team Members who returned. Only eight men returned. Two died on the planet and two remained for some unknown reason. Those two did not wish to return to Earth. But the returning crew brought back thousands of photographs.